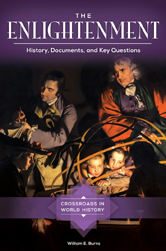 The Enlightenment: History, Documents, and Key Questions is a one-stop reference that serves high school and undergraduate students in learning about the background of the Enlightenment. The book also provides readers with key insights into the distant origins of American democracy and technology-based innovation.The text's coverage of the Enlightenment from the late 17th century to the late 18th century in both Europe and its American colonies supports Common Core critical thinking skills for English Language Arts/World History and Social Studies. Question 1: Was There an Enlightenment for Women? Question 2: Was the Enlightenment Secular? Question 3: Was the Enlightenment Democratic?